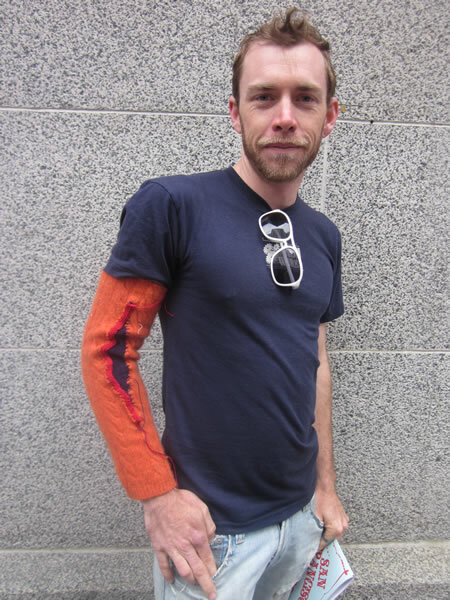 I am a machine knitter by trade, and with this project offered up knit interventions (wounds) to ready-made clothing provided by both passers by and myself. My work in fashion and fine art textiles and clothing has featured these “wounds” for many years, and I have been long preoccupied with surrealism, ruptures and wounds, contrasts of surfaces and materials, deconstruction to reconstruction, and the metaphoric emotional notions of “the walking wounded” and “wearing your heart on your sleeve”. Selling clothing on the street is a strange and wonderful experience. 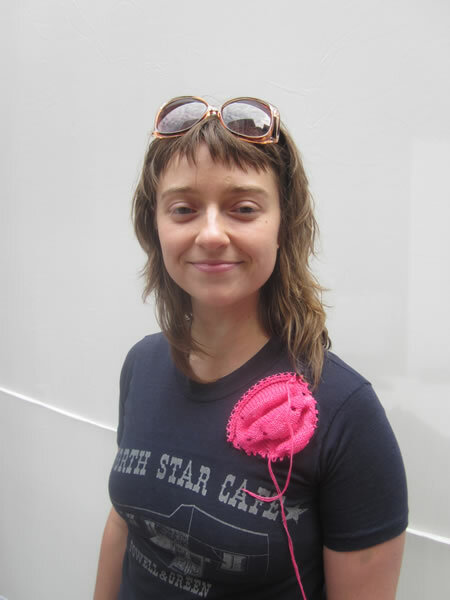 Customers inevitably build out whatever drag the vendor has organized, by the simple act of trying things on in a public place and sizing themselves up in the mirror and with companions, or even to strangers passing by, saying: ”how do I look? 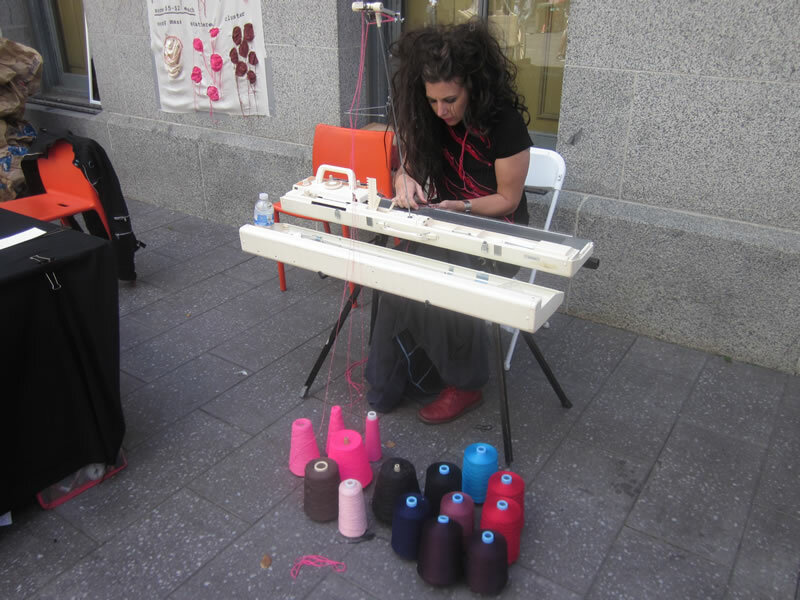 ?” My live knitting at the Cries of Sf event resulted in crowds gathering to watch the machine knitting process, which is a dance between a human and a machine that many people have never seen, and interested customers leaving my stand dressed as the newly walking wounded. 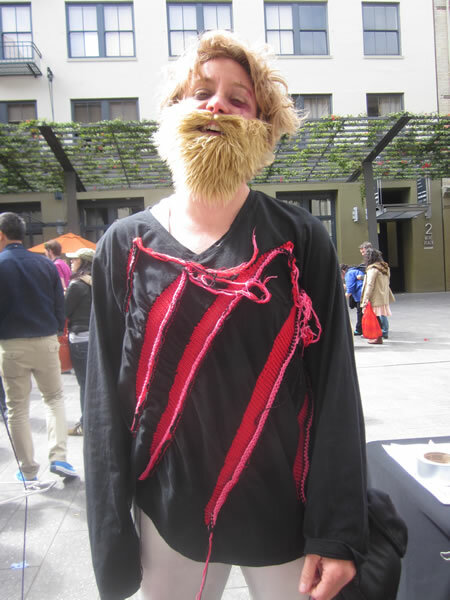 I came to the June 2011 event prepared with pre-existing, up-cycled clothing to sell that contained the knit wound interventions, but more importantly, I offered my knitting services to passers by for a small fee, so they could have wounds inserted into their own clothing. 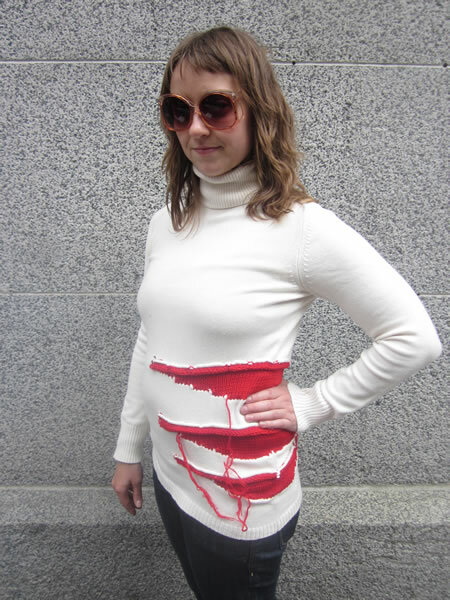 People literally gave me the shirts off their backs and I made clean cuts in them and immediately closed up the cuts with knit material fused to their garments on the spot. Each intervention took around ten minutes. 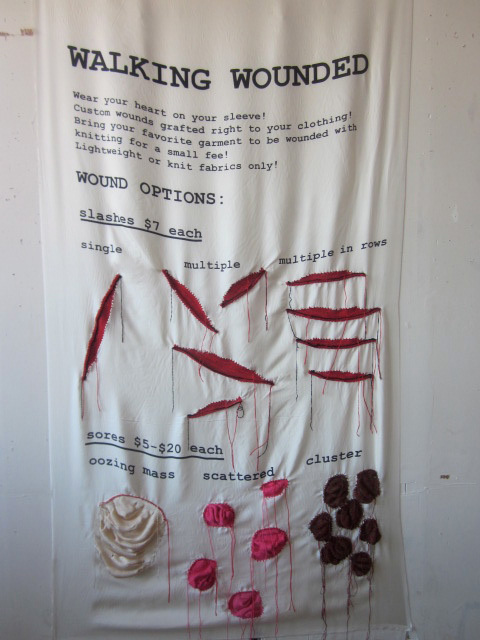 There was a sample chart at my stand to show the types of wounds and yarns available and price info. This project will be repeated in the future.